I don't like the term California cuisine. The food fairy godmother Alice Waters coined the term that loosely translates to local, seasonal, freshly prepared, farmers market driven fusion food with French, Japanese, Mexican and Italian influences. In this wacky age of eating as entertainment (T.V. shows such as Cupcake Wars, Master Chef, Iron Chef etc. 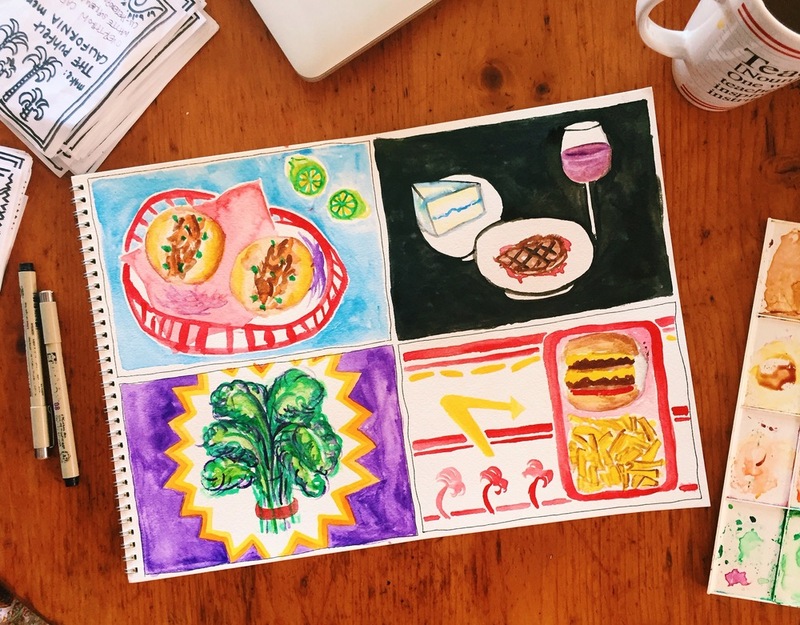 ), eating as political act (#realfood #eatclean #wholepaycheck), and eating as artistic endeavor (fuccbois love social practice and social practice gets hungry a lot), California cuisine has risen to unparalleled heights of popularity. In the late 60s and 70s, when American cooking was heavily inspired by European tradition, California's nod to Asian and Latin American influenced food was seen as bold, refreshing, even revolutionary. However, in drawing inspiration and then drawing a thicket picket fence of preciousness and high price points around the food, I'd argue that this move has been a lot more imperialistic and a lot less revolutionary. Think of me, with a taco cart, having learnt all the tricks of my trade from my"life changing" spring break to Cabo, now selling $9 California-fusion tacos in the heart of DTLA- that's elitism and culinary colonialism and gentrification all rolled into one artisanal gluten free tortilla. Los Angeles exists today because of its food. It became and remained a settlement because it was "good land for planting of all kinds"- where grains thrived, cattle could graze, vegetables were in abundance and the winter never ever came. And so, the City of Food quickly became the City of Restaurants, where the dream of eating well dated back almost as far as the citrus dream that started it all. Before Southern California became known for its beaches or its mountains or its movies, it was known for the palm sized fruit with a prodigious reputation- the orange. If abundance and the Southern Californian picnic basket are key images of Los Angeles food history- I'd argue that racial erasure would be another, except you know, it's being erased. From the Tongva Indians that lived here long before the Los Angeles basin was "rightfully" claimed and settled, to the Chinese and Japanese immigrants that came for the railroad and stayed to work the groves since the late 19th century, to the Mexican, Indian, Vietnamese, Iranian and Cambodian populations that have fueled and fed this city ever since- Southern California was not born on a single westward immigration story, an escape from New England cold to this land of perpetual summer. For many, it came from the controversial change in the 1965 Immigration Act that finally gave South Asians access to suburban inland neighborhoods in which to raise their families. For some, it came from fall of Phnom Penh on April 12th, 1975 and the fall of Saigon on April 30th, 1975, from the Iranian Revolution of 1979. The Southern Californian immigrant narrative is so much deeper and broader than just a train journey to the West, and the lure of a backyard citrus orchard. In buying that narrative, there is an erasure of so many communities of color and histories of immigrations that were a vital part of creating a California dream to buy into at all. Jonathan Gold, the Pulitzer Prize winning LA Times food critic, the father of this City of Restaurants if there ever was one, doesn't use the term ethnic to describe any kind of food. So-called American food is just as "ethnic" and yet, only Vietnamese or Armenian or Indian food get slapped with the ethnic label. That's culinary colonialism for beginners. So then, how is it that even J. Gold, the pinnacle of critical food writing, is okay with this narrow awkward term that is California Cuisine? Have you ever been to Sqirl? People have written so many beautiful, carefully and thoughtfully constructed sentences on the unfussy fussiness, the quiet, subtle deliciousness that exists at Sqirl, that it feels bossy to come in and stamp all over them. For some context- Sqirl is a hip day time eatery on a recently gentrified cement corner of Silver Lake that dishes out vegan rice bowls and ricotta brioche toasts that have been instagrammed about as heavily and risen to fame about as quickly as the Kardashian family. Sqirl is meant to represent updated California cuisine, with a Los Angeles twist. Whilst Sqirl's artisanal jam selection, it's heirloom Kokuho Rose brown rice (the Louis Vuitton handbag of the brown rice family), its pickled avocado chilaquiles and the generous support of local farmers that this restaurant and others like it expound are all delightful and delicious things, they are also not delightful and delicious things. Their claim as the proprietors of California cuisine is perpetuating the same cycle of oppression and racial erasure over and over again. In the construction of a singular citrus-dream-never-ending-summer-white-man-goes-west immigration narrative, or a singular precious California cuisine-kale bouquet-avocado-sushi-coconut-smoothie-fusion-food narrative, we need to ask ourselves- who are these stories of immigration and cuisine really for? Who is allowed to or enabled to use these terms? Who is this food really for?